The community-owned Islay Energy Trust, the Kintyre Energy Trust and the Tiree Community Development Trust formed the Argyll Renewables Communities (“ARC”) Consortium to identify ways in which their communities can become active participants in the development and operation of offshore wind and marine energy projects, rather than merely bystanders, so as to ensure the best possible outcomes for their communities, as well as for all stakeholders. ARC believes that genuine collaboration between communities, corporate interests and consenting authorities can lead to both enhanced value for the developers and optimisation of benefits to communities. The Argyll Renewables Communities (“ARC”) Consortium is supported by the Argyll and the Islands LEADER Programme, HIE, RSPB Scotland, SNH and ScottishPower Renewables. 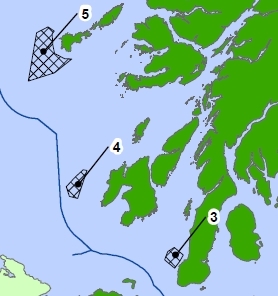 The seas west of Argyll contain some of the main tidal, wave and offshore wind energy resource areas in the UK. Specifically, in March 2009, the Crown Estate announced exclusivity agreements with developers to investigate three large scale offshore wind projects: Airtricity off Kintyre (378MW) and Islay (680MW), and ScottishPower Renewables off Tiree (1500MW). Meanwhile, the Scottish Government is conducting a strategic environmental assessment (SEA) of offshore wind resources, due to be published early in 2010. The Scoping Report for the socio-economic impact assessment of the proposed offshore wind farms in the Argyll area is now available. The report was commissioned by the Argyll Renewables Consortium (ARC) and written by SQW Energy and SQW Consulting. It sets out the context of the proposed developments and defines the scope of the assessment. On 30th June 2010 ARC announced the next phase of their social and economic impact assessment (SIA) of the proposed Argyll offshore wind farms. This follows a successful funding application to EU LEADER, which will be matched by contributions from ScottishPower Renewables, HIE, SNH and the RSPB Scotland. The SIA will be carried out by a team which will include representatives of the local communities, the consultants SQW Consulting (who published the initial ARC SIA Scoping Study in January 2010), and Dr Jill Shankleman, a consultant sociologist with 25 years experience of social impact assessments. The key issues for local communities are firstly, to understand all of the potential impacts of the development and operational activities associated with these wind farms, and secondly, how to maximise positive benefits and minimise negative outcomes. The SIA will enable local communities to develop their own opinions from a position of knowledge. It will also give local communities the confidence that their voice is being heard, that they are fully involved in the development process and that well-balanced judgments can be reached. ARC’s Response to the Scottish Government’s Draft Plan for Scottish Offshore Territorial Waters can be downloaded here. All three Trusts already have experience of involvement in renewable energy projects. The Islay Energy Trust has signed a Memorandum of Understanding with ScottishPower Renewables for the development of a 10MW tidal energy array in the Sound of Islay; the Tiree Community Development Trust have installed a 900kW wind turbine, and Kintyre are developing wind turbine and hydro projects. In addition, the Trusts have a wide range of relevant skills and experience available to them through their members and Trustees. Jim Mather, MSP for Argyll and Minister for Energy, Enterprise and Tourism in the Scottish Government, attending a meeting of the consortium in July, gave a warm welcome to the ARC project. He said: “this is a ground-breaking, collaborative initiative by voluntary community groups, whose proactive involvement with developers and other bodies could help local communities with fragile economies become more sustainable”. Nicholas Gubbins, Chief Executive of Community Energy Scotland also welcomed the initiative, stating, “The ARC approach offers a real opportunity for the developers to get it right from the earliest stage of the proposal. We do hope that there will be full and constructive dialogue resulting in Scotland’s first community-friendly offshore wind”. Meetings have also been held to brief officials of the Scottish Government’s Renewable Energy Division, the Crown Estate, the Scottish Renewables Forum and Highlands and Islands Executive. Initial discussions with the developers have also taken place.